The will be a meeting of the Italian section on Saturday 1 December. Scaffale Inglese means English Shelf. 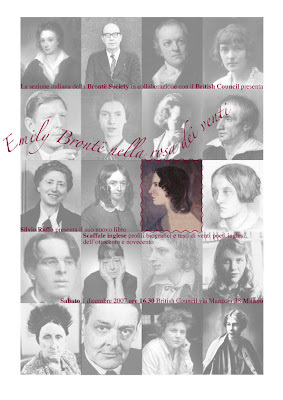 The meeting will cover the lives and works of twenty poets - including Emily Brontë of course. On Saturday 24 November 2007 at 7:30pm in Leeds Town Hall, the World Premiere of Brontë Mass by Philip Wilby, will be performed along with works by Vaughan Williams.The performers are the Royal Liverpool Philharmonic Orchestra and Leeds Philharmonic Chorus, with soloist Leigh Melrose (baritone), conducted by David Hill. Anne Brontë’s A Prayer, with its linked themes of faith and doubt ends this part of the composition, here set for a cappella choir and solo trumpet. The second half is celebratory in tone, opening with Emily Brontë's No Coward Soul and concluding with the Gloria. Professor Philip Wilby is the Director of Composition Studies in the School of Music at the University of Leeds. He has worked as a professional violinist, and joined the staff at Leeds in 1972. He has received commissions from California State University-Fresno, St Paul's, Norwich and Liverpool Anglican Cathedrals, the BBC and English Northern Philharmonia. He is well-known for his connection with brass band and church music, and has described Baroque and Classical composers as very influential - he has played in Christopher Hogwood's Academy of Ancient Music on a large number of recordings on authentic instruments. As part of his work in the School of Music, he has reconstructed performing editions of a number of unfinished scores by Mozart, including a new edition of his Mass in C Minor K427. Much of his work is informed by his Anglican faith: his wife is a priest and he has lived in vicarages for many years. See what's on in Leeds International Concert Season.